A few weeks ago, I reviewed the Mele F10, a dual sided 2.4 GHz remote with a QWERTY keyboard and gyroscope, and found it to be a very good complement to any Android STB or mini-PC, with some caveats such as none optimal key arrangements, a lack of play/pause button… You can also use it with Windows and Linux. This product has been available for sale for a while, and Mele has just introduced a new version, called Mele F10 Pro, with better accuracy, and a built-in microphone and speaker for voice command or video chat apps such as Skype and Google Hangout. The new RF receiver dongle is much bigger than the original one which could be a problem if you use it with a mini-PC directly connected to the HDMI port of your TV, but I’ve been told the larger size is due to extra components to handle audio. One good thing is that all keys on the remote side appear to be useful, the right and left mouse button have been moved, hopefully to free the center pad as an Enter button. The are also next / prev buttons, and a gaming button, as the remote can also be used with a number of games (about 16 are officially supported). They’ve also made a number of chances to the layout of the QWERTY keyboard side, but I’m not sure I really like all of those chances, except potentially for gaming, and you can now access the 2 mouse buttons from both sides. For those hoping for a tab key, it’s still missing, but with the mouse buttons being there, you don’t need to turn over the remote to click on next. I’ll have to try to get a better feel. The device is available for pre-order $38.87 including shipping on Mele’s aliexpress store, and it should ship by the end of the month. You can get a $2 coupon there [Update: The aliexpress coupon is only valid for orders > $100, but they’ve told me you could write “I know F10 PRO from cnx-software” in the comment field during the order process to get $2 off], and get 10% discount on week-ends. You can cumulate both offers. There may also be some $5 coupons around, but I don’t know of a working one below $50. I’ve noticed Mele does not always price their own devices very aggressively in their Aliexpress store, but with the week-end deal and $2 discount, the discounted price (~$33) might be reasonable. For reference, I paid $25 for the original version of the Mele F10. Play/Pause/Stop buttons are still missing, but my main problem in XBMC was the location of the “OK” button. It looks like it’s fixed. I don’t like the huge USB dongle either. They may send me one (not sure), so I may be able to compare it to the original. Yes , the OK button which activated the mouse was crap, hopefully they fixed it ! what about the MK702II from rikomagic? that looks quite good. have you done a review for that? It looks good too, and about the same price range and features as Mele F10 Pro. I haven’t done a review, but it’s quite slim, and it can also be used as a programmable IR remote, so it can replace your other remotes (TV, aircon, dvd player…) as well. 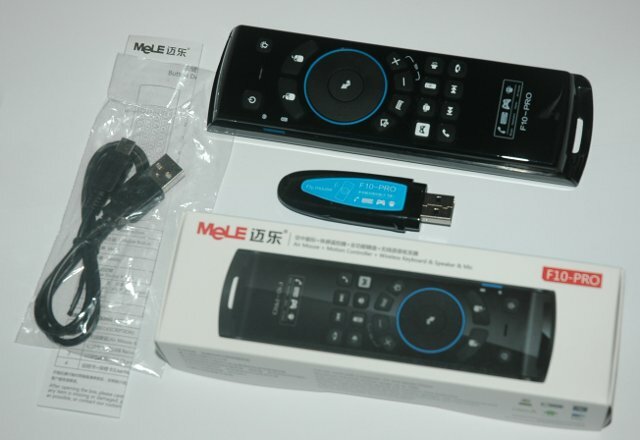 I have bought the first version of Mele f10 to use it as an XBMC remote. it is quite good. what I am really missing is a reprogrammable TV power switch… is this now possible with the Mele f10 pro? And anyone can confirm that all buttons on the front now send a key code? thanks xncsoft for your reply. I have seen that remote… and it looks interesting to me indeed. But do you know whether the front (the remote part) can be used to send keyboard presses or only IR signals? since I dont have an IR receiver on my XBMC HTPC, it would be necessary to have keyboard signals sent from the upper part of the remote to navigate inside XBMC. you know? OK, I see what you mean… I don’t know about this, you’d better ask on Rikomagic forums, or even on XBMC forums if somebody already have the remote. Got the F10 Pro today and it’s pretty amazing. Mouse button is now seperated, so that the OK button in the steering cross can be used without activating the mouse. Did not try the other features yet. oh I forgot, the air mouse feature is more smooth and precise and the center ok button works as left mouse click only when in air mouse mode, thats perfect! ie MK702II – which does have a tab key! I’d be interested, is battery life worse vs. F10 (non-pro) due to addition of audio? I don’t have the Pro version, only Mele F10, but the cursor will disappear after a few seconds if it is not in use. I am looking for a way to use volume buttons of my Mele f10 pro, problem is that they work only when i select Mele as audio output but stop working if I have selected normal speakers. How can able to hear the music and videos through f10 pro mouse. I have android smart TV box which has option sound output through USB output. But I can,t hear the voice through earphones. Is I have to install drivers or special application for that.